«OVER GROWER®» - is a completely automated hydroponics system for the remote plant cultivation. It is not just a mixing unit; It is a whole system of eight sensors, which creates ideal conditions. Excellent harvest full of vitamins and of excellent taste. Intuitive interface, touch screen on the device. Remote control via Internet from a computer or smartphone. Plant a seed, turn on the device and installation, and wait for the harvest. hydroponic system with nutrient solution and light. equal to 1 to 660 tomato bushes. one growing area and one growth stage. in which to cultivate plants. Connected to Internet via Wi-Fi and Ethernet cable. Control interface has a high-scale security. period of growth is carefully stored in the device's memory. of plant from seed to harvest. PH acid level and amount of TDS fertilizers. device in our laboratory in Novosibirsk. The City Farmer Hydroponic Multi-shelves System for home and commercial plants growing indoor even without sunlight! The most cost-effective solution for commercial greenhouses and indoor farms is vertical farming. MAKE YOUR WALL OVER A SALAD BED! The GrowPillar technology promotes opportunities to city farmers to grow fresh greens, using all available space. It’s an excellent solution to make a commercial cultivation of most types of greens! Ready-to-use solutions for your different budget basis agribusiness! We can create your salad farm, according to your requirements using the latest technologies for your commercial cultivation based on our experience. April 16 The Partnership Agreement with Gulf Construction Trading & Construction Est executed! 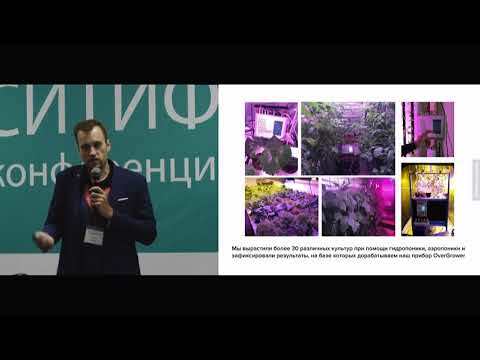 OverGrower invites you to the 2nd International Exhibition-Forum "Urban Technologies - 2019"
Roman’s presentation have caused a furor! Trial operation of the first «OverGrower» complex for remote automated hydroponic plant control allowed for solving a number of tasks, as well as to improve service of the hydroponic system to a fundamentally new level by fully automating main technological operations. ✖ Thank you for Request. Will contact you ASAP.